Posted by Ali Kane on Thursday, March 21st, 2019 at 2:34pm. The Flagler Museum, formally known as the Whitehall estate is one of the most famous homes and landmarks on the island of Palm Beach. The elegant 100,000 square foot estate was built in 1902 by Henry Flagler as a wedding gift to his wife Mary. Henry Flagler was an American Industrialist and founder of Standard Oil, who is known for developing Florida’s east coast and responsible for making Palm Beach, America’s first resort destination. The grand estate features 75 rooms and was built and designed in the Gilded Age. Flagler commissioned John Carrere and Thomas Hastings to design and built the mansion for Flagler. Hastings and Carrere were also the architects for other landmarks during the Gilded Age such as the New York Public Library and the Waldorf Astoria Hotel in New York City. The front of Whitehall has a red barrel tile roof and giant white marble columns along the front façade, and a central courtyard built around the home. The estate features two stories, an attic, and a full basement. Henry Flagler passed away in 1913 and his wife Mary gifted the home to their niece in 1917, who went onto sell the home to a group of investors. The investors added onto the home and created an eleven-story tower on the west side of the home, transforming the mansion into a hotel that operated from 1925 until 1959. The hotel housed famous guest when they were in town, some of the famous hotel guests include Walt Disney, and Politicians. The hotel closed in 1959 and the structure was restored back to its beauty by Flagler’s granddaughter in 1959 in fear that they mansion would be razed. Today, the former hotel and home is now open to the public for tours. The home still features Flagler’s collections of antiques and art as well as information about the Gilded Age time period, which is known as America’s most interesting time period. The mansion also has Flagler’s rail car on display that Flagler used to travel in. 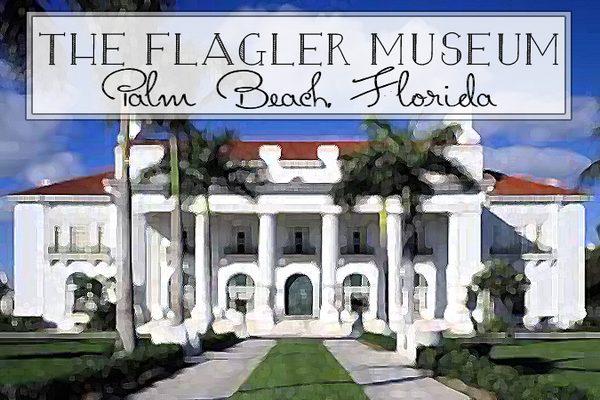 More than 100,000 people from around the world has traveled and visited the Flagler Museum. Tickets are required for admission and can be purchased online or at the museum’s door. Included in the price of admission are guided tours, audio tours and self-printed guides. Adult tickets are $18 dollars for 18 years old and older, $10 dollars for children 13- 17 years old, children 6- 12 are $3 dollars and children under 6 are free. To purchase tickets online, click here. The Museum is closed on Mondays, Thanksgiving Day, Christmas Day and New Year’s Day. The Museum is located at One Whitehall Way, Palm Beach.